Luke has been a certified personal trainer in the fitness industry for 15 years where he specializes in a holistic approach to weight-loss for the busy professional. Personal fitness is not just a profession for him; it is a daily personal lifestyle choice that gives him insight and experience in everything he teaches. Through his own journey, he has gained an understanding of the obstacles clients face in achieving success more importantly, he has mastered the art of personal and group training through effective encouragement and creative program design. As a Nutritional Therapy Practitioner, has specific tools for managing clients & assessing the body’s nutritional deficiencies using the body’s innate intelligence, and teaches clients how to address those weaknesses through properly prepared, whole foods diet, supplementation and lifestyle changes. His relationship with Jesus is the foundation of what drives his character and strives to live by biblical values. He and his wife, Sarah, have been married 7 years and have 3 beautiful children- Zoe, Jude, and Ezra. Luke’s vision for Enshape Fitness is to “Transform each client from the inside out”. Jessica joins us from Texas and is enjoying all the different weather Illinois has to offer! Jessica recently joined Enshape as the new administrative assistant, confident she was entering a friendly, caring and devoted environment. She is so excited to be a part of a team where the kind of values and vision that she admires are widely present. As hobbies, (and in warmer weather) she enjoys natural light photography, hiking, and visiting nature reserves to view scenery and wildlife. Her three pets mean the world to her (a dog, a cat, and a rabbit) whom she will happily tell you more about if you are also a pet lover! Jessica loves to cook and listen to music (even both at the same time!) and loves the results of making vegetables taste good and impressing her husband. Jessica also takes a deep interest in nutrition and mental health, and believes in the saying “Eat your food as medicine, or you will eat your medicine as food”. 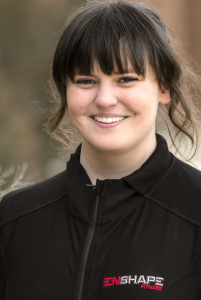 Don’t hesitate to reach out to Jessica with anything- she is happy to help! She’s so excited to support people on their journey and witness the amazing transformations that take place at Enshape. 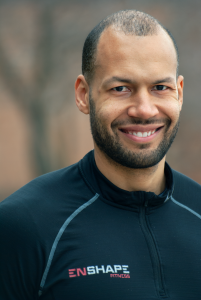 Jimmy is a Certified Personal Trainer through the National Academy of Sports Medicine. He is a Certified Speed and Explosion Specialist through the National Academy of Speed and Explosion and a certified Performance Enhancement Specialist and Corrective Exercise Specialist through the National Academy of Sports Medicine. 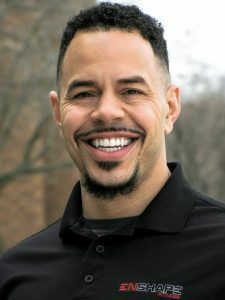 He has a Master’s Degree in Exercise Science with a concentration on Performance Enhancement and Injury Prevention from California University-Pennsylvania. Jimmy received his undergraduate degree from the University of Illinois at Urbana-Champaign in Psychology Pre-Pharmacy track. While at Illinois, Jimmy played football and was a member of the 2007-2008 team that went to the Rose Bowl. Jimmy’s dedication and love for the game led him to pursue a professional football career. In 2010, Jimmy was given a 9.4 out of 10 combine grade by Elite Pro Football Combines (now known as NFL regional combines), results impressive enough to get him a once in a lifetime opportunity with the New Orleans Saints. Karen is a certified personal trainer as well as group fitness instructor with an undergraduate degree in Nursing. Karen is a lifelong dancer and athlete, having studied and performed classical ballet, as well as jazz, tap, hip hop and all the latin formats such as salsa, bachata, cha cha and so on. She is passionate, determined, and when she hears”no” it means “not that way” to her! Karen hopes to be a role model and an inspiration to others and is still active in the dance world! 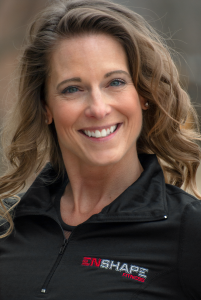 One of her favorite quotes is: “You make a living by what you get, but make a life out of whatyou give!” Karen truly loves helping others whether through fitness, nutrition, or dance…..MIND, BODY, SOUL – a complete connection. She is the proud Mom to two grown sons and understand the challenges of balancing work, family, and so on. Don’t be fooled by the short stature and smile…She doesn’t mind kicking some bootay in the gym. 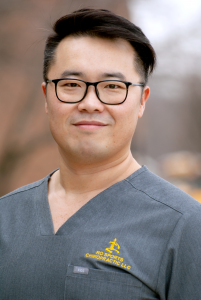 Dr. Ro’s passion for helping people realize their full potential in body, mind, and spirit is his life’s mission. He has been practicing since 2011 and has been in Naperville since 2012. He is originally from South Korea and came when he was 10 years old. He grew up in a martial art household and is a 5th degree black belt in Tae Kwon Do. Growing up in America allowed him to get involved in variety of sports. He was naturally drawn to football and was fortunate enough to play through college. Along with playing college football, he was dealt with multiple injuries. He suffered many injuries from torn muscles and tendons to broken bones and concussions. Living through all those injuries, he felt my body dealing with delayed recovery time. After college, that is when he chose to take control of my body and take care of it to perform at its best. The answer was lifestyle transformation and main ingredient was CHIROPRACTIC! Chiropractic allowed his body to be aligned and heal itself. He truly experienced life transformation through chiropractic lifestyle. To date, he has lost 70 pounds since his college football days and blood pressure is back to normal. He is on a mission to show people how to live pain-free life without use of drugs or surgery. Unlike boot-camps and large group personal training classes that just make you break a sweat, our comprehensive services focus on empowering you with all the components required to produce life-long health and fitness results through our individualized coaching and accountability programs.